Selwood has been on the same site in Bournemouth Road in Chandler’s Ford for over 70 years. Our company has grown, and we now employ almost 600 people in 28 locations across the UK. Chandler’s Ford is our Head Office where we manufacture our market-leading pump range, but we also operate plant hire and pump hire branches on the site. Our administrative and support teams are also based here. To help us continue to grow and continue to provide employment for around 200 people on the site, we need to redevelop our layout and our buildings. We are planning to redevelop our Head Office building – the building along the front of Bournemouth Road, to make it more accessible, more efficient and more representative of the company we have become. We also have plans to move some of the other buildings on the site, to make our operations more streamlined and effective. We’d like to share our thoughts with you and we will be holding two open days, so you can come in and hear more about our plans for the site. 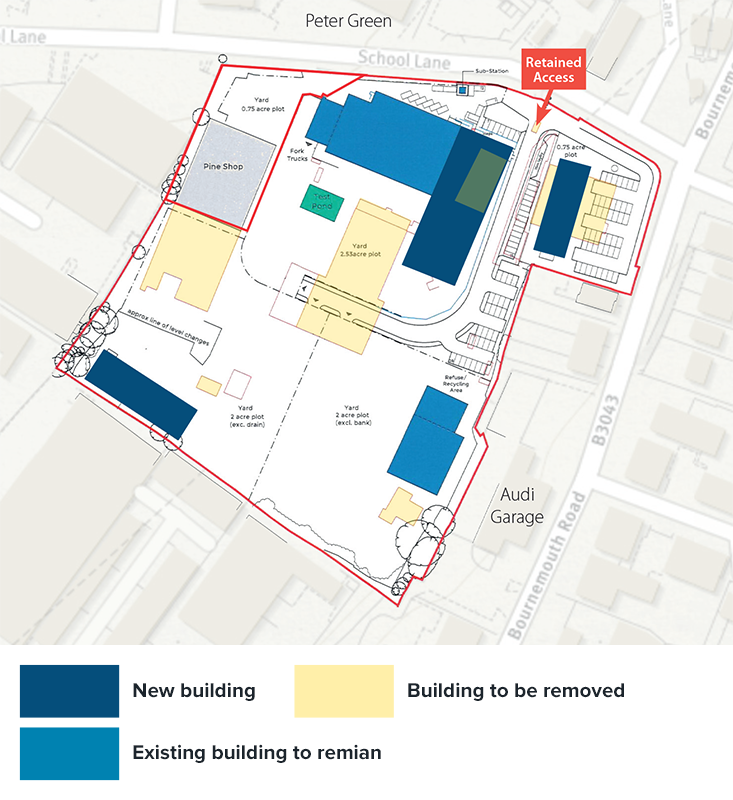 We have been working closely with the local planning authorities to make sure that the plans are sympathetic to the overall look and feel for this area and that the redevelopment will improve the environmental impact of our business. Come along and find out more about our Head Office site development plans. Our CEO, Chris Garrett and Chief Operating Officer, Richard Bright, will be on hand to talk to you and share a little bit about our company, our culture and our plans for the future. This will be a phased development which is expected to take over 3 years. The final stage will be our Head office building which currently fronts onto Bournemouth Road. This is expected to be developed in 2021 – subject to planning permission. The plans enable us to continue operating from the site with minimal disruption to our operational teams and to our neighbours. Will the entrance to the site stay in the same place? Yes, the main entrance to the site will be in the same location, but the security barrier will be set further into the site to stop waiting vehicles from blocking School Lane. What will the new development look like? We expect the site to look more modern – some of the buildings at the rear of the site will look more like our branches (see below). Our Head Office building on Bournemouth Road will be a more architecturally designed building with a feature reception. Below is an indicative drawing from our architects. Will there be enough parking for all your staff on the site? Yes, we are asking for planning permission for as much parking as we need to accommodate all our staff. During the development phases there may be short periods where parking is restricted and staff will be encouraged to work at our other locations or make use of public transport. What about the Selwood Christmas tree? We will make sure we have suitable space for our Christmas tree and there is likely to be additional landscaping, giving our site increased greenery all year round. Please call our Chandlers Ford Head Office on 023 8026 6311 for more information.